Trainer Matt Dunn has warned he won’t hesitate to abort exciting galloper Care To Think’s Doncaster mission if he doesn’t tick a couple of important boxes at Royal Randwick on Saturday. The Magic Millions Cup winner is a $15 chance in TAB’s market for the Group 1 $3m The Star Doncaster Mile (1600m) run on April 7. 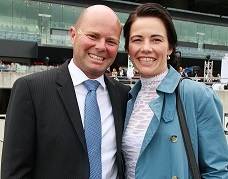 Trainer Matthew Dunn and wife Keira. (Pic: Grant Guy). Because of his place in the Doncaster market it’s no surprise Care To Think opened the $2 favourite for the Group 3 $150,000 Liverpool City Cup (1300m) and Dunn said he’s carrying a good level of fitness despite a seven week break. “He’s definitely tough enough to run a mile at Randwick but I have a small concern he might not settle as well as he needs to,’’ Dunn said. “He’s going into this race pretty close to fit. He’s got a bit left in him but not a whole lot so I need his racing manners to show us that he’s going to go that way. Plan B for Care To Think would be to refocus on the Stradbroke Handicap during the Brisbane winter but Dunn concedes the gelding’s 51.5kg in the Doncaster is a weight he’s unlikely to have the luxury of in the future. Dunn was in Sydney on Wednesday to oversee the four-year-old’s final gallop where he cruised 1000m at Rosehill with a final 400m in around 24.25 seconds. “It’s pretty standard for him and it’s pretty good time compared to others that have galloped here over the last couple of weeks,’’ he said. Care To Think had a week off after his Magic Millions Cup win in mid-January but stayed in the stables and spent daytimes out in the paddock. Dunn said while the proof of whether he could be a genuine Group 1 miler will be known after Saturday but everything he’s done since he started his winning streak in July is evidence he could be the real deal. “He’s got himself there really quickly and he’s done it the hard way,’’ he said. “His three starts this preparation, first-up he was stuck deep and second-up he came from an impossible spot at the 200m and even at Magic Millions he was three deep the trip. “It’s quite incredible the improvement he’s shown in the last few months and who knows what he can achieve when he gets a decent run in a race. Lightly raced gelding Sepoy’s Choice will be aiming to be Dunn’s 15th TAB Highway (1600m) winner on Saturday. The four-year-old was a maiden winner at Ballina before finishing runner-up in a Grafton Class 1 over a mile on February 8, earning him a shot in Sydney. “He has lots of talent and probably doesn’t race as well as he goes,’’ Dunn said. TAB opened Sepoy's Choice at $9 in Saturday's Highway.